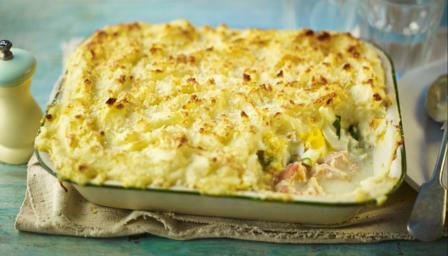 This posh fish pie combines smoked haddock, salmon and prawns, homemade parsley sauce and a cheesy mashed potato topping. For the potato topping, place the potatoes in a large pan of boiling salted water and cook for 15-20 minutes, or until tender. Drain the potatoes well and mash them with a potato masher or ricer along with salt, white pepper and butter, to taste. Stir in the gruyère and set aside the potatoes, keeping them warm. For the poaching broth, place the fish stock, vermouth, onion, fennel, carrot, celery, bay leaf and saffron in a large pan and bring to the boil. For the fish, place the white fish, smoked haddock, salmon and prawns into the broth and poach for three minutes. Using a slotted spoon, gently remove the fish from the pan and set aside. Pour the broth through a sieve into a clean pan, discarding the vegetables and herbs. Bring the broth back to the boil and simmer until reduced by half. For the parsley sauce, heat the butter and flour together in a pan over a low heat, stirring to make a paste. Add the reduced broth a ladleful at a time and keep whisking until smooth. Add the milk and the parsley, bring to the boil, then reduce the heat and simmer for ten minutes. To finish the sauce, add the double cream to the pan and season, to taste, with salt and white pepper. To assemble the pie, butter a casserole dish generously and flake the set-aside fish, discarding any skin and bones. Lay the fish in the casserole dish and pour about half of the parsley sauce on top (reserve the remainder of the sauce to use as a pouring sauce on the finished pie). Bring a large pan of salted water to the boil and add the spinach to the pan. Blanch for a minute until the spinach has wilted. Drain well. Slice the hard-boiled eggs and lay on top of the fish, followed by the blanched spinach. In a small bowl, mix together the ciabatta crumbs and the parmesan. Sprinkle the cheese breadcrumbs on top of the pie. Place in the preheated oven and bake for about 20-25 minutes, or until the top is golden-brown. Reheat the parsley sauce and serve the pie hot with the remaining parsley sauce poured over.